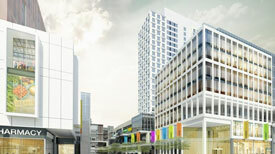 Please have a look at Boston Properties new North Station development. The Hub on Causeway’s office tower was originally approved to rise 420 feet and span 668,000 square feet. 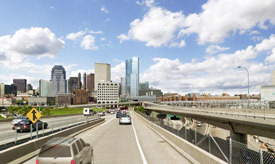 Boston Properties is seeking approval now to build a 24-story tower rising 495 feet at its highest occupiable point, spanning 651,500 square feet. 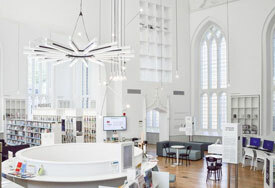 The project’s architect is Gensler. 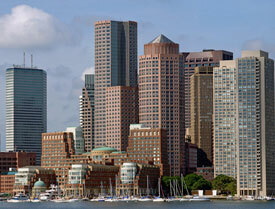 Boston office design still includes the basics, but now a genuine focus is placed on employee retention. Flexible, creative and communal space are the buzzwords that are exchanged when office tenants share their ideas of what their new space should embody. Instead of trying to find one seamless solution for everyone, organizations are working to develop new spaces that will cater to different working styles in order to encourage a balance between effective and efficient workspaces. For more information, jump over to Biznow’s complete coverage. The Motor Mart Garage as we know it might be different in years to come. In 1927, when it was built, it stood as the largest parking garaging in the world; now that title is held by West Edmonton Mall in Alberta, Canada, with parking for 20,000 vehicles. Speculation appears to support that structure as we know it won’t go through a complete demo, but might be changed significantly. Sources say possibilities for the garage’s redevelopment include building on top of the existing seven-story structure or tearing it down completely. Another possibility would be a partial demolition, threading a new building through the garage while leaving portions of it intact. Beyond the 1,037 parking spaces, the Motor Mart Garage also houses 50,000 square feet of retail space, including Legal Sea Foods, Fleming’s Prime Steakhouse and Maggiano’s Little Italy. The garage spans a full block and is bounded by Park Place, Stuart Street, Church Street, Columbus Avenue and Eliot Street. If you have coffee shop and are looking to expand, Mayor Walsh wants to speak with you about City Hall. The amenities that building offers are a tremendous asset to their occupants and the mayor is taking a page out of the private playbook. Looking forward to seeing who lands the spot, and it’s safe to assume it will be a group with strong local roots and good beans. Additional details are available on the BBJ’s website, here. Tremont Crossing continues with its march towards becoming a reality. 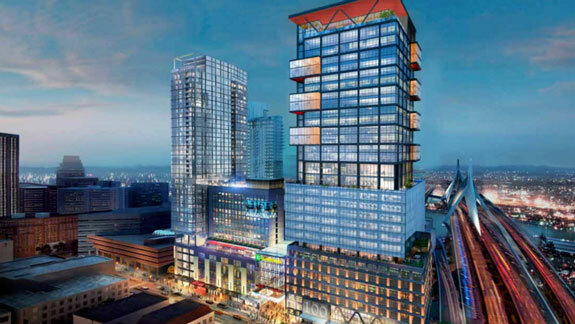 The South Station tower moves closer to reality despite some obstacles. The tower would be built on spec. The Boston Planning & Development Agency board approved plans for a 51-story office and condominium tower over the busy rail hub…Development firm Hines would build the tower above the rail shed at South Station, with a lobby along Atlantic Avenue. That lobby would fill in the gap between South Station’s main concourse and its bus terminal, and would expand the bus facilities by 50 percent. 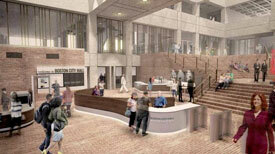 It would also expand a parking garage, adding 527 spaces. Above that, Hines would build 1.1 million square feet of office space and condos in what, at 677 feet high, would rank among the city’s tallest buildings. Later phases would add two mid-rise buildings atop the station. 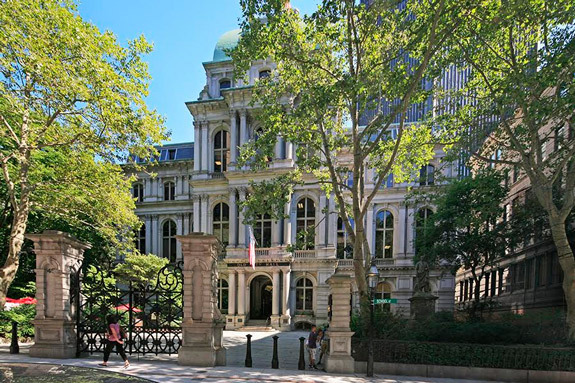 The Boston Classic, Old City Hall is going up for sale. 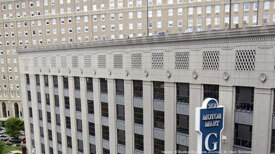 The building, constructed in 1862, contains 106,508 RSF over 9 stories with a typical floor plate of 11,834 RSF. Boston’s Old City Hall was home to its city council from 1865 to 1969. It was one of the first buildings in the French Second Empire style to be built in the United States, according to Wikipedia. You can read the full Real Reporter article, here. More “me space” and “we space” is what the city is looking to do in DTX. 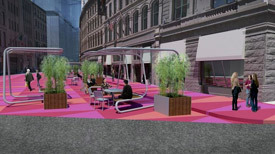 Space to gather with colleagues or sit alone and update your profile is the aim of the pilot public plaza along Franklin Street and Arch Street. The Boston Transportation Department on Tuesday morning will temporarily widen sidewalks at Franklin and Arch streets, the first step in a pilot program that will study creating permanent public plaza at the intersection. 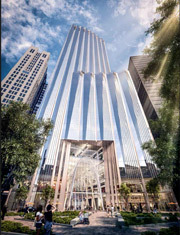 Millennium Partners wins the prize for the impending Winthrop Square development. The proposed tower would stand 750-feet, adding office, residential and retail space in downtown Boston. You can read the full article on the BBJ, here.